Laminectomy, sometimes abbreviated as ‘Lami”, is a decompression-type	surgery whereby the lamina is removed. The root ‘ectomy’ refers	to removal and ‘lamina’ is a sheet of bone that partially	forms the spinal canal. Patients with the diagnosis of stenosis are candidates	for a laminectomy. The surgery is designed to decompress a narrowed, or stenotic, spinal canal. This stenosis is the result of degeneration in the spine which causes	disc bulging, thickening of ligaments and joint capsules, and bone spur	formation. Imagine a cross-section of the spinal canal as being a simplified	2-dimensional house with a floor, 2 side walls, and a roof. The nerves	run through the house like a train through a tunnel. When a patient has	stenosis, the roof of the house is collapsed and constricts the nerves. The extent of the roof collapse depends on the extent of the stenosis	which in turn determines the extent of the laminectomy. Sometimes only	partial laminectomies may be needed, while other times necessitate a complete	laminectomy. Eighty-nine percent of our patients have had pain reduction with a laminectomy	with an average pain reduction from 7/10 pre-op to 3/10 post-op. 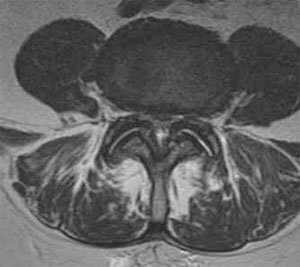 This is a case of a 72 year-old male who complained of standing and walking	pain that was relieved with forward flexion type maneuvers like bending,	squatting, or lifting a leg up upon a step. The pain began in the low	back and radiated into the bilateral buttocks and the back of his thighs. It would begin within 10 minutes of standing, most notably while standing	in-line at places like the bank or supermarket. His MRI demonstrated severe	stenosis at the L4-5 (Figure 1). Figure 2 demonstrates an MRI image through	his normal L2-3 level. He had failed non-surgical management in the form	of medications, injections, and physical therapy. He ultimately underwent	a laminectomy at the L4-5 level with significant improvement in his standing	and walking tolerance. He is now able to stand for over an hour without	leg or back pain. Figure 1. 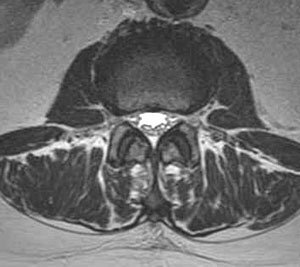 MRI image through L4-5 demonstrating severe central and lateral	recess stenosis caused by disc bulges, thickened ligament, and enlarged	bone spurs/joint capsules. demonstrating a normal open spinal canal.